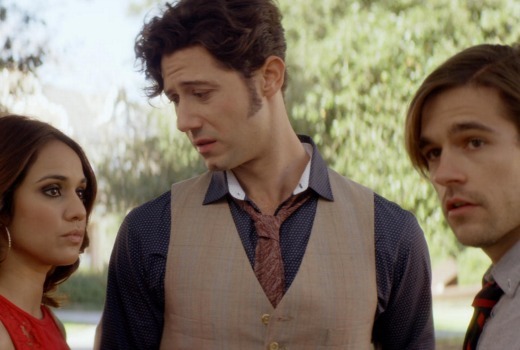 US drama The Magicians begins on Syfy next month. The series centres on Quentin Coldwater, a brilliant grad student chosen to attend Brakebills University for Magical Pedagogy, a secret upstate New York university specialising in magic. He and his 20-something friends soon discover that the magical fantasy world they read about as children is all too real – and poses grave danger to humanity. Based on Lev Grossman’s best-selling novels, it stars Jason Ralph, Stella Maeve, Olivia Taylor Dudley, Hale Appleman, Arjun Gupta and Summer Bishil. It begins with a double episode premiere on Friday, May 13 (of course!) at 8.30pm. The series premiered in the US in January. In the season premiere, Quentin – a brilliant, but depressed college student from Brooklyn, NY – learns that magic is real when he is offered admission at Brakebills University, an exclusive graduate school for magicians. Once ensconced in school, he quickly discovers, firsthand, the darker and terrifying side of magic. The drama continues at 9.30pm, where the Brakebills students struggle to deal with the aftermath of a catastrophe that befalls the university. Back in Brooklyn, Julia makes her first foray into the mysterious world of Hedge Witches. Recurring guest stars this season include Rick Worthy as Dean Fogg, Anne Dudek as Professor Sunderland, Jade Tailor as Kady and Esme Bianco as Eliza. Friday, May 13 at 8.30pm on Syfy.